So Tuesday’s weather was 72º degrees. Today we are experiencing a blizzard with up to 12″ of the white stuff. It’s definitely Springtime in Colorado and in a couple of days (depending on the depth of drifts) we’ll enjoy the conditions below. Happy National Puppy Day. Hug a puppy today-it’s more fun than listening to a talking camel on ‘Hump’ Day. hahaha Love the bottom picture! Yup, we’re cold here today too! Happy National Puppy Day! In our part of the north of South Australia, we don’t have snow – ever. However, that does not mean that it does not get cold. It can get very cold here and it’s starting to get a tad colder on our morning walks. I actually miss the snow but my wife tells me it’s misplaced nostalgia -selective memory – and it’s not as great as I remember it.. Hug a puppy – will Benji do?? It’s consistently sunny, 70s and nice here. Boring compared to there and we’re not that far away. Boring can be good some days! We are glad we live where it never snows. Sounds like our forecast! Have a great day. The snow depth has doubled in half an hour! This is gonna be a wild one. Good old Sprinter (aka Spring/Winter ) – where the temperatures from day to day are decided on a cosmic roulette wheel. Haha, love that. Sprinter indeed! Hope it’s on the warmer side in Chicago today, but be prepared for when it comes your way. We had snow too. . . Which is why I can’t go to shelters anymore. I’d load up as many as could fit in my car and drive off! 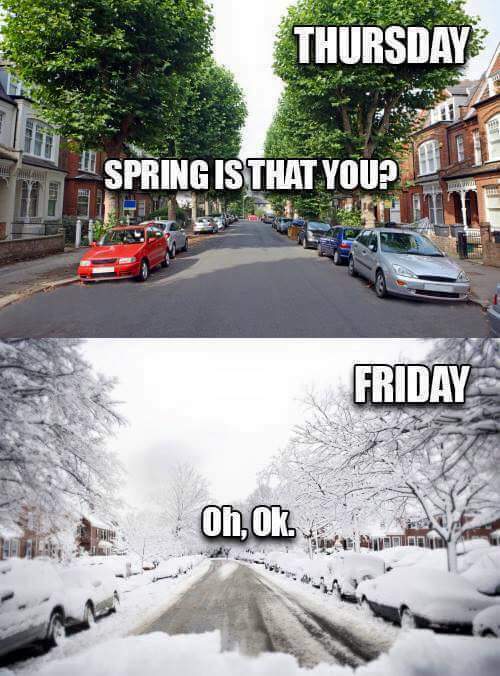 that’s Spring for you. We had a swing like that, without the snow luckily. Of course you get to see lovely mountains all the time, and have low humidity… you gotta pay something girl! I mean if we had to have our high humidity and bugs, and have those kinds of snow/72 degree days it wouldn’t be fair! The extremes make for good maple syrup on the other hand… Guess you can make a snowman while wearing your swimsuit. Now that’s a picture!